Why choose Top Notch Towing for fuel delivery? We understand the precise needs of different vehicles and makes and offer our fuel delivery service accordingly. We know all the locations in Salt Lake City, Utah and the bet ay to reach them. No place is beyond our reach. We have a diverse and extensive fleet of services, experts and vehicles so we can help numerous clients at the same time. Just let us know the exact need and we will make sure a professional in that area reaches you with all the necessary tools and equipment. So if you are driving around Salt lake City, Utah and worried about running out of fuel- just get in touch with us! Your Salt Lake City Fuel Delivery Experts! Salt Lake City, Utah is a beautiful city that’s always bustling with life. It has many interesting things to see and do and enjoys a great season all through the year. It attracts many tourists every year, with major commercial hubs it also invites many professionals for work trips and of course the local population is rich and extensive too. The wide roads of Salt Lake City can make driving for work or pleasure, a great experience. Travelling in and out of Salt Lake City via roads also gives you a great driving opportunity. Well, if that’s the case then there shouldn’t be any inconvenience right? Inconveniences or roadblocks can occur anytime and one that has been faced by many is running out of fuel. However well you plan your drive or journey, this is something that can come up anytime. The fuel consumption changes according to the roads, traffic, and many other reasons so one can never be 100% sure. Running out of fuel can be a total disaster leaving you with no option but to be stranded and hope someone comes and helps you. Right? No! When you have Top Notch Towing you ALWAYS have a solution no matter what the problem is! We have an efficient fuel delivery service that will bring fuel to you, whichever corner of the city you may be in. Just tell us where you are and what kind of vehicle you are driving and we will deliver the adequate amount of fuel accordingly. We will make sure that you can carry on driving, at least till the next fuel station without having to push your way through. Our fuel delivery service is carried out by locals and professionals who know the best and fastest ways to get to you. You will be surprised by how many calls we get every day for fuel delivery service and we are proud to say we deliver it to all. Sometimes you may not be on the road but at home starting your day when you realize you don’t have enough fuel. Just call us and we will give you the fuel delivery so you can carry on with your daily routine. So whether you are stuck without fuel at home, in the middle of nowhere or even in your office, Top Notch Towing will reach you. Fuel delivery service by Top Notch Towing was specially added to the list of services we offer as the demand grew. Sometimes the car is working perfectly and you don’t need a towing away service all you need is fuel. 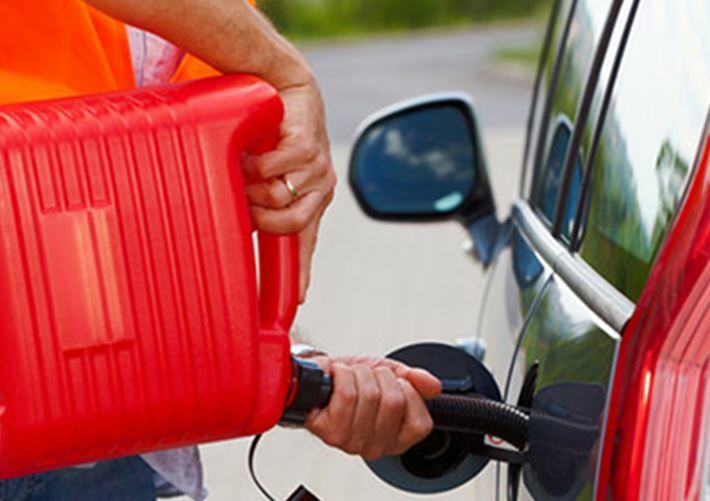 To add to your convenience and the passion to offer precise and required services we started out the fuel delivery service and are pleased to see the amazing response. Today we have helped so many people and helped them get back on the road with our fast, reliable, efficient and professional fuel delivery service.